Cassava is native to Brazil and Paraguay and is a staple food throughout Indonesia and Thailand, as well as parts of Africa. Its roots serve as an excellent source of starch and, at 330 calories per cup, cassava provides energy you need to fuel your active lifestyle. Adding cassava to your diet offers health benefits because of its vitamin, mineral and fiber content, but you must only eat cassava after it has been cooked to avoid exposure to toxins. Cassava comes loaded with carbohydrates, including the especially beneficial carbohydrate dietary fiber. Consuming fiber is linked to a number of health benefits, including lower blood pressure, reduced cholesterol levels, better control over your blood sugar levels and a lower risk of obesity. Each cup of cassava -- approximately half of a root -- boosts your fiber intake by 3.7 grams. This contributes 10 percent toward the fiber intake recommended for men and 14 percent toward the fiber intake recommended for women by the Institute of Medicine. Cassava also helps you consume more magnesium and copper. A diet rich in magnesium promotes life-long health, lowering your blood pressure and reducing your risk of osteoporosis, while a diet rich in copper helps support healthy nerve function. A cup of cassava contains 206 micrograms of copper, or 23 percent of the copper you need each day, determined by the Institute of Medicine. Cassava also increases your manganese intake by 0.8 milligram per serving -- more than one-third of the daily requirement for men and 44 percent for women. The vitamin C and folate abundant in cassava also offer health benefits. Each cup of cassava contains 56 micrograms of folate, or 14 percent of your daily folate intake requirements, as well as 42 milligrams of vitamin E. This amount contributes 56 and 47 percent towards the daily vitamin C intake recommendations for women and men, set by the Institute of Medicine. Including more folate in your diet protects against colon cancer and reduces the risk of complications during pregnancy and a diet high in vitamin C offers protection against coronary heart disease and several types of cancer. Don't eat cassava raw, because it contains chemicals called cyanogenic glucosides, which act as toxins. Cooking your cassava by roasting or boiling reduces these compounds to safe levels. Prepare cassava similarly to how you'd prepare potatoes. Try peeling it and cutting it into chunks, and then roast it, coated lightly in olive oil. Alternatively, boil pieces of peeled cassava and then mash for a dish similar to mashed potatoes. If you want to add more flavor, try mixing the mashed cassava with roasted garlic, or mash it with boiled carrots to add natural sweetness. 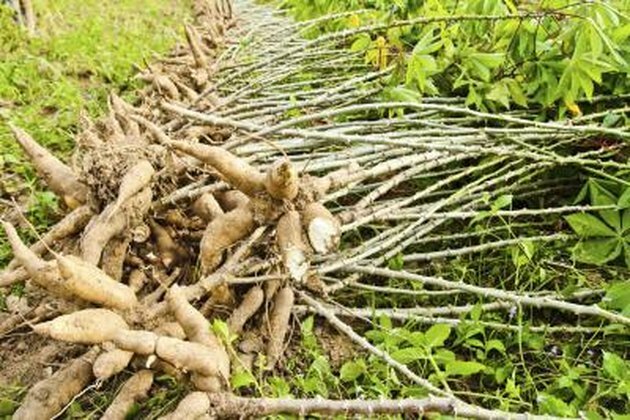 Is Cassava a Diet Alternative for Diabetics?